Good, Fast, or Cheap. Choose Two. How true is the above statement, really? With the rise of open source products one would think that it’s possible to find a product that ticks all of the above products, and is free to boot. I found this out recently when I tried using SQL server to load in some website log data so I could generate some reports. Geez, it was slow. It ran at about 45 records per second. Inserting about 64 million records could take a loooooong time. On the other hand, I remembered the faithful MySQL server that I had used a while ago. Loading data into MySQL was fast – about 600 records/sec fast. And it’s free. But is it good? When actually getting around to running the reports, I was finding that MySQL was falling short. Due to its architecture, sorting operations had to be done by writing a temporary table to disk. This could be worked around by using indexes, however often the indexes would not be picked up, plus the reconfiguration of an index over 64 million records can take 2-3 hours, thus slowing things down. So either way it was a headache. I know that SQL server is very efficient at sorting and searching records and has its own optimised low-level methods for searching data. If you’ve ever tried to run a database from a compressed drive / folder you would know that certain operations do not work because SQL server accesses data at such a low level. And I think it’s that sort of optimisation that you would happily pay for. Whilst it may be slow on the insert side, it’s fast on the searching side. So, “Good, Fast, or Cheap. Choose Two.” – I think the saying has real meaning here. An open source product may have the commitment of a small group of developers or no commitment at all. A paid product has a real business motive to keep developers “on the ball”, continually optimising and improving the product. Recently I have had to create a store locator for a website I have been working on. On the outset, it sounds easy. Simply add a number of points to the map and calculate the distance between a point of reference and the points you have added. Then the question comes up: How do you calculate distance? As the crow flies, or by road directions? To test this out, I created a Google Maps Distance Calculator. Road directions work, and are not too difficult to get from the API. However, they are dead slow and require callbacks. Sometimes a request may take up to 30 seconds, which means that it could take ages to render the distance between 10 or so points. Furthermore, sometimes the distance cannot be calculated at all. You will need to add some divs for containing the map and listing areas. By default, the map element is assumed to be a <div> tag and the listing container is a <table> tag. "Google Inc.","<strong>Google Inc. Head Office</strong>"
Both methods take similar arguments. The first takes a GLatLng (point) object + a description, whilst the second takes an address and a description. The first method is much faster than the second as no request has to be made to the server to look up an address. If you run this in your browser, you should see a map appear with two locations shown. Clicking on either will reveal the name of the location. Now the only thing left to do is allow users to enter in an address. This is as simple as adding the method and form below. When the form is “submitted”, a search is made for the address. When the form is submitted, a new point is added to the map and the distances are shown. Here are some other tips about the script. Recently I have had to create a reporting system for some server log files. It was sort of an ad-hoc thing; It was really done in a rush because we couldn’t get AWStats to process the files properly and the customer had a really steep deadline to meet. This was going OK with SQL Server Express. The logs would be imported and then analysed. Whilst it wasn’t blazingly fast, it could import a few hundred meg of logs data in a few minutes so I could start generating reports. Then one day I got the request to do the same thing but for the company’s most busiest site – their intranet. Each log file exceeded a gig, which often meant over 7 million records per file. Unfortunately, SQL Server Express was not keeping up all too well, it would start off well, processing around 500 records a second, but as time went by this crawled down to <10 records per second, PLUS, after an overnight run I realised that SQL Server stopped accepting records, with the data file blown out to 4GB at just 3 million records. That's only HALF a log file! I started looking at my options. The company I work at loves SQL Server, so I thought of ways to make it work. Hmm. Storing less fields? Sacrificing my indexes? Those are not good options. Then, I thought back to my old days of using MySQL. I remember how spastic it used to be, joins were always slow, queries had to be arranged so that they would be optimised in a certain way etc etc. But then, my app is only using one table. My queries are basic (for the most part). It was worth a try. So, I started again. I created the table in InnoDB. That was a bad move, it was slow from the start at only 40 records per sec. But then, I'm the only one using this app. I don't need transactions, why am I using InnoDB? The answer was clear - try MyISAM. So I dropped and recreated the table as MyISAM and restarted the import. Wow - instantly the result was clear - over 1000 records/sec! The import has now been running overnight and there is no performance degradation. Imports are still running between 800-1000 records/sec and the table now contains 48 million records! And the file size? 10GB including indexes - this is only 2 and a half times the SQL Server file yet it is holding 16 times the amount of data! AND I have just started running queries - queries that took over 60 seconds to execute in SQL server on less than a million rows are now taking a similar time but I have over 48 million records in MySQL. I think this is a perfect case of the right tool for the right purpose. MySQL - you're a life saver. A website I was working on a while back had a requirement for an animated background to be running whilst users were on the website. The main problem was, that every time a user would click on a new page, the background would restart, interrupting the user experience and slowing things down in general. So what do we do? Inline frames? Create an AJAX service that returns the site content? 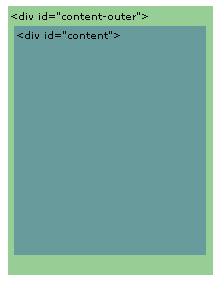 JQuery uses css selectors to identify elements, e.g. 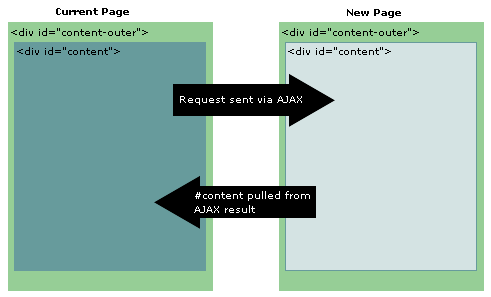 <div id=”content”> = #content, so what this function does is it looks up the element #content-outer, executes the AJAX request, and then looks up the #content element from the next page and replaces the contents of the #content-outer element with the new element, as demonstrated in the below diagram. I have also added the following routine that will be called on startup. It effectively adds the loadPage(URL) method to each link’s onclick method. Because loadPage(URL) returns false, when the link is clicked, the AJAX call will be initialised and the user’s action will be cancelled. Furthermore, I have also added a callback to the method which will update the page title and replace any links within the new page content. The only thing I have left out of this is history management. By using the script above, users lose the ability to switch back and forth between pages. By using the jQuery history plugin, you can give users the ability to switch back and forth between pages, and also the ability to bookmark AJAX'd pages. If you’re supporting any legacy applications, then it’s probably only a matter of time until you will get that call early in the morning… “Hi, this is technical support, your server’s down. It seems to have run out of space on drive X…”. This could have easily been avoided if you had set up some sort of alert. The should be easy right, as easy as using a cfdirectory tag… Oh wait, hold on, other than a recursive listing and summary being extremely inefficient, cfdirectory doesn’t tell you how much space is left on your drive. Well, we’re all lucky that ColdFusion is built on top of Java. As it turns out, since JDK 6.0 Java has exposed drive information via the java.io.File library. Dumping out #lstDrives# would return something like “A:\,C:\,D:\” etc. If you wanted to set up an alert, you could use the readAccess / writeAccess flags to determine whether the drive should be checked. Chances are that if a drive cannot be read or written it is most probably a CD drive or an external media drive that is empty.